As bugs are normal around the house here in Malaysia, I have just gotten used to them for the most part. Yes, the wall next to me is a veritable graveyard for mosquitoes, but most other insects don’t bother me much, alhamdulillaah. This includes ants. Ants are usually very benign, they mind their own business, and they even are basically the bottom chain of clean-up around the house. That is, anything biological that we failed to remove, they take care of for us. 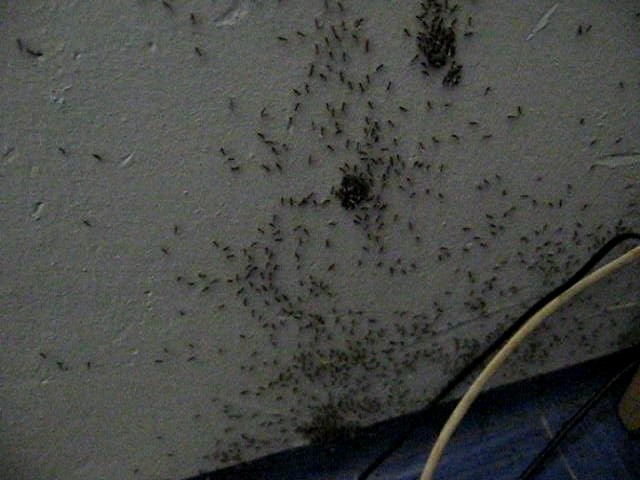 So, it was only with a casual non-alarm that we regarded the increased amount of ant activity in our bedroom. They were more apt as of late at finding our food and swarming it, but that’s just ants. Until I came into the bedroom one day in the afternoon and found the following. Yes, the ants were invading! Actually, I quickly discovered that they were actually moving, but in such huge numbers. I, personally, in my life, have never seen this number of ants before. I was shocked. I quickly tried to blow them all out the window, but that really wasn’t so effective. They just came back, albeit a bit more scattered. And that did nothing for the enormous amount of antlife that were underneath our light plastic tarp-style tiling. I do not think I am exaggerating when I say the total count of ants was in the tens of thousands. You can identify that they’re relocating by the fact that they’ve brought with them their larvae, which, upon close inspection, look like ants, just completely white. That is just INSANE! – why don’t you exterminate them? Or at least keep a few friendly spiders around. I seriously regret doing that. I think, if we just left them for a few hours, they would have moved to another location and left us alone.